Home Unlabelled Four dead as passenger jet crashes into highway outside Moscow. Four dead as passenger jet crashes into highway outside Moscow. A passenger jet crashed into a highway after making a hard landing at Moscow’s Vnukovo Airport. At least four people were killed and four critically injured, says the Interior Ministry. Officials believe the cause could be pilot error. Two people were found dead at the scene of the TU-204 jet crash, while a 27-year-old woman died on the way to hospital. Whether the fourth person died at the scene or in the ambulance remains unclear. Those killed are the captain, the co-pilot, the flight engineer and a flight attendant, the Emergencies Ministry declared. Four people taken to Moscow hospitals – three flight attendants and a technical staff – remain in a critical condition. They have sustained traumatic brain injuries, say medical officials. By midnight the wreckage of the plane had been cleared and the traffic on the Kievskoye Highway fully restored. Pardubice's press-service told Gazeta.ru. The service added the plane, tail number RA-64047, had taken tourists to Pardubice and was going back without any passengers. Two more people might have been on board the crashed plane as ten people had registered for the flight, reports Interfax citing sources. But as emergency crews wrapped up their search operation, they failed to find anybody else. It appears that passers-by could have rushed at least one injured person to hospital on their own car, some reports suggest. A video showing the moment of the jet crash has appeared on YouTube. Filmed by a dashboard camera from a passing-by vehicle, it videoed the exact moment of the crash-landing on the Kievskoye Highway. Two black boxes were recovered from the scene of the crash, according to the Investigative Committee. “Both flight data recorders have been found. Investigators are examining them. Then they will be handed over to decoding experts,” the official spokesman of Investigative Committee Vladimir Markin said. 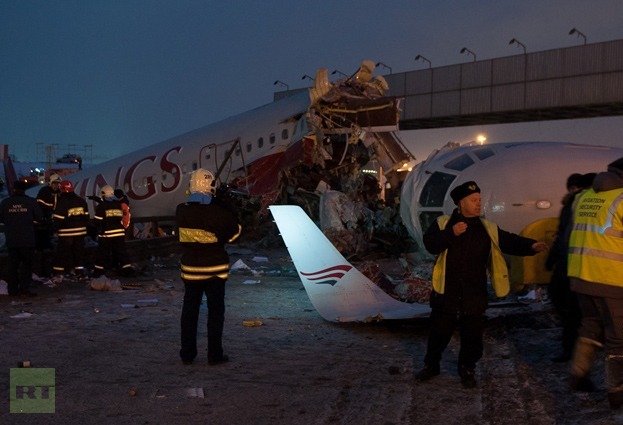 A criminal case over possible flight safety violations has been opened in connection with the Vnukovo plane crash. The preliminary cause of the TU-204 accident is pilots’ error, Markin added. The incident took place at around 16:35 local time (12:35 GMT). Preliminary reports say the jet, which belongs to Russian low-cost airline Red Wings, crashed after taking a second landing attempt. It rolled out from the runway into Kievskoye Highway, fell into three pieces and caught fire. The fire area of 100 square meters was extinguished by firefighters, officials said. Media allege that Vnukovo firefighting cars were on repair so the first emergency crews appeared on the scene no earlier than 50 minutes after the blaze broke out. The circumstances of the incident are being clarified. 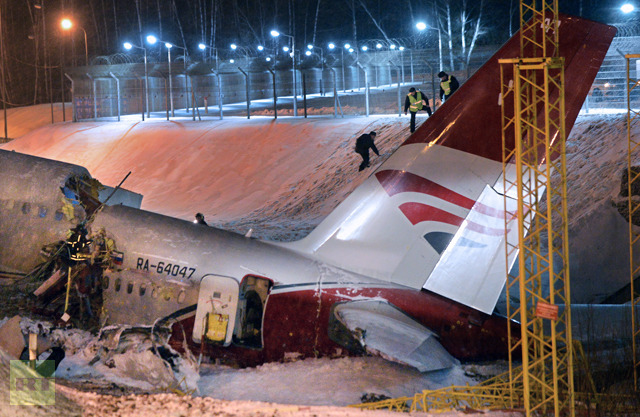 Prime Minister Dmitry Medvedev ordered to set up a special investigation group to look into the accident. Earlier, the Russian Emergency Situations Ministry confirmed that the plane had to make a forced landing. Witnesses say smoke from the crashed plane was seen from far away. “I saw one woman all covered in blood. It was a flight attendant. She said the plane overshot the runway, but it wasn't carrying any passengers and that another flight attendant survived as well as the pilot,” witness to the crash, Aliya Kuchina told RT. “Emergency teams came very fast, but the ambulance couldn’t get through because of the traffic. They gave the injured flight attendant first aid to our best knowledge and called her mother to tell her she’s ok and even found a car to get to the hospital,” she added. Other witnesses say that Kristina Baranova was first taken away by a shuttle bus where she was attended to by a paramedic who happened to be there. As soon as an ambulance managed to make its way through the heavy traffic, the flight attendant was rushed to hospital. Part of the crashed Tupolev-204 blocked the highway; a huge traffic jam developed at the scene. At least 18 Vnukovo-bound flights were diverted to Sheremetyevo and Domodedovo airports. Vnukovo resumed work three hours after the incident. The wrecked jet leaked fuel so emergecy crews had to cover it with foam to prevent the plane from catching on fire. 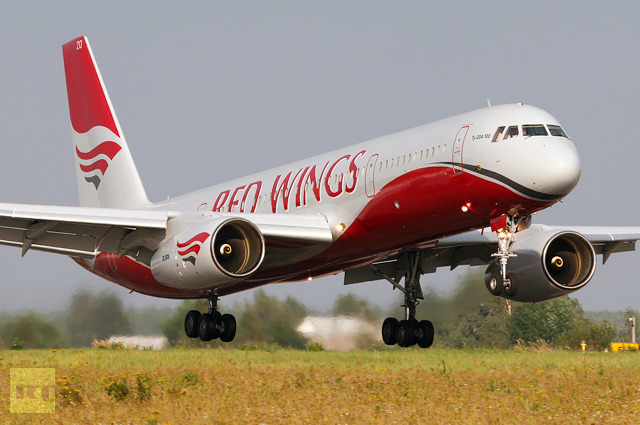 Red Wings is a Russian airline that specializes in charter flights to Russia and Europe. In 2012 the company began to operate regular flights throughout Russia. The company is the largest buyer of Russian-made Tu-204 airplanes.